EthoSource of Philadelphia has found a new home in King of Prussia! After three years on Yerkes Road, minutes from the King of Prussia mall, we are excited to have found a beautiful office space on Moore Road for our new furniture showroom. Starting May 1st, customers and clients are welcome to come visit us at our newly renovated office to view furniture mock-ups and displays, or schedule an appointment to meet with one of our knowledgeable sales reps to discuss your office project details. From collaborative benching workstations to private office environments, EthoSource has the ability to help customers create the perfect culture for their office. And with new, pre-owned and refurbished furniture options, businesses of all sizes can get the brand names they want at a cost that fits their budget, in addition to the possibility of customizing their furniture to match their unique look. If you’re a large, Fortune 500 company or a one-floor office in Center City, just contact us or check out our new showroom for ideas! 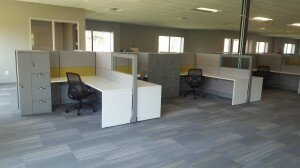 EthoSource Office Furniture is moving from our current location at 411 Yerkes Road, just off Henderson Road, to 681 Moore Road, Suite 321, King of Prussia and will be open Monday through Friday from 8:00 AM-5:00 PM for customers to stop in and explore samples of our product offerings or meet with a sales representatives to learn more about your project details and how we can help you. Inventory as well as information about EthoSource can be found at www.ethosource.com. Based in Morgantown, PA, EthoSource offers complete office furniture management solutions, while specializing in refurbished Herman Miller Ethospace®, a frame-and-tile workstation system that provides a functional yet aesthetically pleasing office environment. Whether your business is relocating, downsizing, reorganizing, moving, or simply upgrading its existing furniture, EthoSource also offers a full-service professional operation that handles the purchase, disassembly, and removal of all types and brands of excess furniture. Herman Miller and Ethospace are registered trademarks of Herman Miller, Inc.
EthoSource is not affiliated with or sponsored by Herman Miller, Inc.